We had a busy March assembly on Friday as we had a lot of awards to give out. 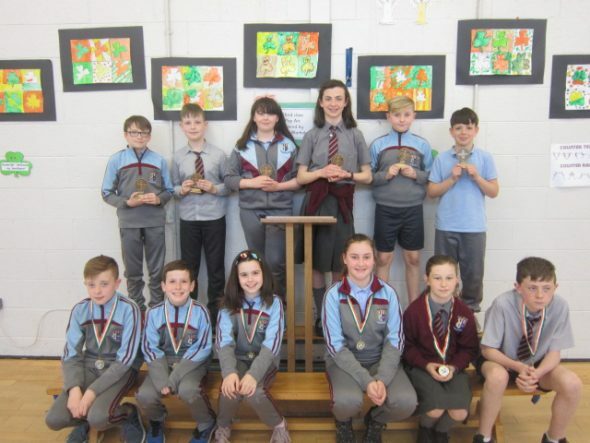 Children were presented with awards for gaelic football, hurling and indoor soccer. The first award was for most improved junior footballer and that went to Tom Ryan from 3rd class. Ethan Desmond from 4th class won the player of the year award. The girl’s gaelic football team had a great year reaching the final in Croke Park so it was a difficult decision for Ms. Lowry to pick only two winners. In the end Ellen Eakins and Caoimhe O’Connor won most improved player and player of the year respectively. Seán Murphy from 6th class won the senior boys player of the year and Zac O’Sullivan (6th class) won the most improved player. Again, it was very difficult to choose only two players as there were so many star performers all year. Finally, the winners of the indoor soccer tournament were Adam Harrington, Sophie Rankin, Leah Capcarrere, Ben Heffernan, Sophie Maycock and Cian Moran.